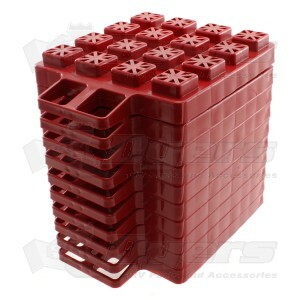 This 10 pack of blocks has solutions for every need! Multiple uses: Leveler, jack or tongue wheel support. EZ-Leveler stacks to required height and is strong enough to hold up to 40,000 pounds! Pads are adaptable to work on hard or soft ground. EZ-Leveler snaps together for convenient carrying & storage. Multi-use: leveler, jack and tongue wheel support. Convenient Velcro strap for storage. Smooth ramp for EZ drive-on. Handle acts as transition to next step. 10" x 8" x 1-1/2"
The weight claims are unrealistic. These are not heavy enough for anything but light trailers or pop ups. They claim to hold up to 40,000 pounds and were trying to colapse with 4,000. Would be OK for light trailers and the interconnecting design works well to keep them in place (but don't expect to raise more than 3 inches with only a 10 pack).